What does “rebuild the military” mean? Has the budget been gutted? 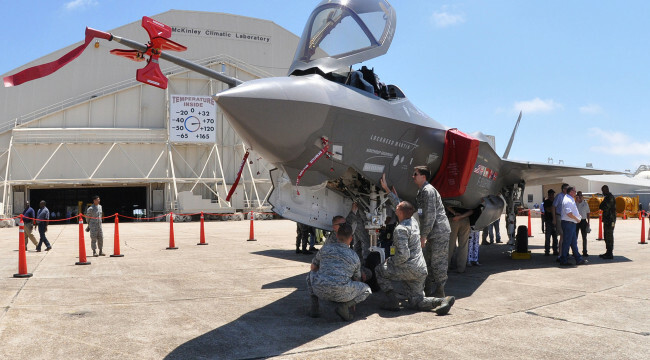 Have the useless weapons programs like the F-35 finally been shut down? No, the United States still spends more on its military than the next 14 countries combined. And the official military budget is only part of the story. The total spending on the US empire is well over one trillion dollars per year. Under the Obama Administration the military budget is still 41 percent more than it was in 2001, and seven percent higher than at the peak of the Cold War. Russia, which the neocons claim is the greatest threat to the United States, spends about one-tenth what we do on its military. China, the other “greatest threat,” has a military budget less than 25 percent of ours. Last week the Pentagon announced it is sending a small naval force of US warships to the South China Sea because, as Commander of the US Pacific Command Adm. Harry Harris told the House Armed Services Committee, China is militarizing the area. Yes, China is supposedly militarizing the area around China, so the US is justified in sending its own military to the area. Is that a wise use of the US military? The US military maintains over 900 bases in 130 countries. It is actively involved in at least seven wars right now, including in Iraq, Syria, Pakistan, and elsewhere. US Special Forces are deployed in 134 countries across the globe. Does that sound like a military that has been gutted? I do not agree with the presidential candidates, but I do agree that the military needs to be rebuilt. I would rebuild it in a very different way, however. I would not rebuild it according to the demands of the military-industrial complex, which cares far more about getting rich than about protecting our country. I would not rebuild the military so that it can overthrow more foreign governments who refuse to do the bidding of Washington’s neocons. I would not rebuild the military so that it can better protect our wealthy allies in Europe, NATO, Japan, and South Korea. I would not rebuild the military so that it can better occupy countries overseas and help create conditions for blowback here at home. No. The best way to really “rebuild” the US military would be to stop abusing the military in the first place. The purpose of the US military is to defend the United States. It is not to make the world safe for oil pipelines, or corrupt Gulf monarchies, or NATO, or Israel. Unlike the neocons who are so eager to send our troops to war, I have actually served in the US military. I understand that to keep our military strong we must constrain our foreign policy. We must adopt a policy of non-intervention and a strong defense of this country. The neocons will weaken our country and our military by promoting more war. We need to “rebuild” the military by restoring as its mission the defense of the United States, not of Washington’s overseas empire.